Introduction to Marine Engineering explains the operation of all the ship's machinery, with emphasis on correct, safe operating procedures and practices at all times. Organized into 17 chapters, this book begins with an overall look at the ship. 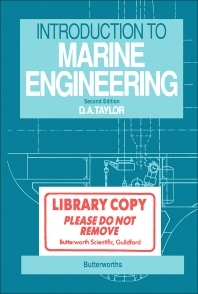 Subsequent chapters describe the various ship machineries, including diesel engines, steam turbines, boilers, feed systems, pumps, auxiliaries, deck machinery, hull equipment, shafting, propellers, steering gear, and electrical equipment. Other aspects of marine engineering, particularly, fuel oils, lubricating oils, refrigeration, air conditioning, ventilation, firefighting and safety, watchkeeping, and equipment operation, are also described. This book will be useful to anyone with an interest in ships' machinery or a professional involvement in the shipping business.